I read this book about 11-Mar-2007. I've read this book before. The book is copyright 1966. This note was last modified Wednesday, 14-Mar-2007 20:39:47 PDT. Possibly the best science fiction novel ever written, by the master of the field. One of my very greatest favorites. And yet, somewhow, I appear not to have read it since I started this booklog. I would say this is Heinlein's most libertarian novel. The professor's "rational anarchism", and the general Lunar culture ("Taanstaafl!" and such), all point towards individual freedom and voluntary cooperation. "Judge" being a function that people are asked to do by the parties to the case, rather than a government functionary, even puts it towards the extremes of libertarianism. Severe problem people being handled by privately "eliminating" the person (out a convenient airlock) does, too. And as early as the end of this very book, it's clear that as the Lunar Republic grew and got older, it was losing more and more of that early liberty. This and Doc Smith probably had a lot to do with my liking for libertarian ideas. Well, along with their own natural goodness, of course. Heinlein has always played around with universes that aren't quite congruent. In this one, a young girl named Hazel Meade is involved in founding the Lunar Republic, marries a guy named Stone, and studies engineering. Earlier, in 1952, he published The Rolling Stones (#2) in which a major character is Hazel Meade Stone, an engineer living on Luna, who was one of the founders of the republic there. Trouble is, that Hazel Meade was born on Earth, and brought a small child to the moon with her when she came. Now, she's not too truthful a person, but that child is also still around, and seems hard to get around. And, really, how could one not love a book where the actual solution to the problem of how to fight the Federated Nations is "throw rocks at them"? 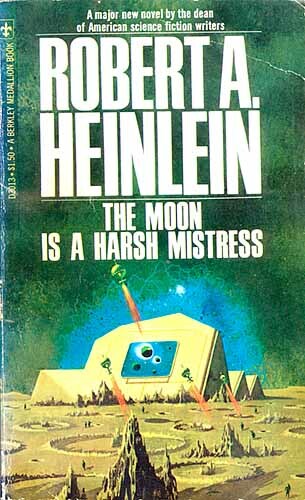 Heinlein is an author that's often underestimated (except by people like me who, some will argue, are over estimating him). In particular, lots of people don't seem to think he has a range of styles he can write, and has full control of his prose. This book ought to nail that nonsense to the floor once and for all; the Loony dialect, with lots of Russian and bits of other languages, and sentence strcutures that also show a lot of Russian influence, is simply not something that somebody without real, serious language skills could pull off. The only thing to compare this to is Anthony Burgess' A Clockwork Orange . On the Moon, initially the population (transported criminals) was 90% or more male. Social structures evolve, so that by the time of this book two-person marriage is almost unheard of. The most common pattern is two men and a woman, but lots of other structures are used, including the "line marriage" that Manny, the protagonist, is part of. Line marriage may well be, as Heinlein asserts, the best mechanism for providing economic and social stability for raising children even invented. I don't think there have been enough trials to really know if that's true or not, though. Anyway, this is an even less monogamous book than Stranger In A Strange Land . This old Berkley paperback has an amazingly bad cover. A bad moonscape, with unexplained yellow buildings sticking up (one of which probably has a huge video screen on the side, which is even crazier), people standing around on the surface (way out of scale), and ships landing (even more out of scale). Just awful. And this is the fifteenth printing of that edition of a Hugo-winning novel, widely thought (at the time, as well as now) to be the best work by the best SF author; so my theory is that the badness is not due simply to cheapness. On the other hand, the 1997 Orb edition that the buy links point to has one of the most gorgeous covers ever on it. I tend to agree with the people who say that Mike's calculating of the odds is questionable; in particular, when they take a risky step that Mike and everybody agree helps their odds in the long run, Mike's current statement of the odds gets worse. That's just wrong; sure, it is a risky step, but the risk is justified only because, in the long run, it improves the odds.